Dr. Marti Cleveland-Innes is Professor and Program Director in the Centre for Distance Education at Athabasca University in Alberta, Canada. She teaches Research Methods and Leadership in the graduate programs of this department. 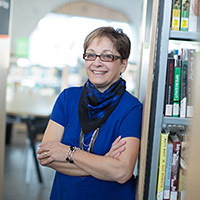 Martha has received awards for her work on the student experience in online environments and holds a major research grant through the Canadian Social Sciences and Humanities Research Council. In 2011 she received the Craig Cunningham Memorial Award for Teaching Excellence and in 2009 she received the President’s Award for Research and Scholarly Excellence from Athabasca University. Her work is well published in academic journals in North America and Europe. Current research interests are leadership in open and distance higher education, online teaching and learning and the effects of emotion on learning.